Under AB 540 undocumented students are eligible to pay resident tuition at California's public colleges and universities. 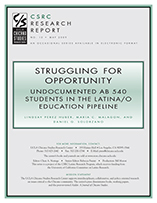 This report reviews the provisions of AB 540, describes a current legal challenge to the law, and evaluates the critical issues that undocumented AB 540 students face. It concludes with a set of recommendations for policy makers and school officials.